Visit Gatlinburg & appreciate fine log cabin craftsmanship with this impressive log home in the Smokies! "Rustic Elegance #422" is a new log cabin... VIEW NOW. Location: Wears Valley Area Looking for a private honeymoon cabin or somewhere to spend your anniversary. 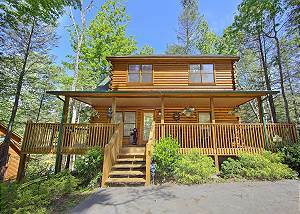 This private one bedroom cabin is tucked away in the mountains yet close to all the attractions which include Dollywood, Dixie Stampede, The Pigeon Forge Island and the Great Smoky Mountain National Park! Americana is a one level log cabin that offers a King Size Bed, Private Hot Tub, Jacuzzi Tub, sleeper sofa and Cable TV for your enjoyment along with all the comforts of home. A fully stocked kitchen with all the items you need and a Gas Grill is just steps away under your screened in private deck. A washer and dryer are included for your convenience. Located minutes from Pigeon Forge. Americana is perfect for Honeymooners or a romantic getaway to celebrate any occasion! Book this affordable 1 Bedroom Cabin Today! This Cabin is priced for 2 adults. Each additional person is just $12.50 nightly. Kids under 12 are free. I am a single parent of a 2-year-old with autism. His mother abandoned us over a year prior. This was this first time we were able to get away from it all since. The check in/out staff was very courteous and gave us a welcome packet that helped. The cabin itself was easy to find and was very secluded. Of course, the best part was the hot tub. My son loved to sit on the edge and splash and have fun. The attractions were fine but the cabin was the best. I have been convinced to rent again next year. No problems at all. Loved the cabin. It was relaxing, yet the directions to the cabin need revised. i.e. it mentions a BP station and its another name, which confused us in the dark. The captain was very cute and decorated beautifully and very warm and inviting. We enjoyed our stay very much everything was very clean and we would do it again the furniture was very comfortable. It was a lovely getaway. Loved the fireplace. The bed was large and luxurious. Super comfortable. Everyone was nice and professional. We were a late arrival and when I got my stuff out of the lock box, i must have dropped my code to get into my cabin. Your staff helped me over the phone so we could get in and rest after our long drive. This was our 2nd stay with Aunt Bugs and will be making more reservations in the near future. Thank you for always making our vacation amazing. Check in was quick and simple. The cabin was beautiful. The cabin was charming and in a great location. Would have liked to have e WiFi, that was the only issue. Everything was perfect the cabin was very cozy and the check-in went smoothly. Cannot say enough about the staff and their help it was outstanding. Cabin nice snd very clean. Parking in this cabin nice, not too steep. Would have been nice to avoid the in person check in prior to arrival since we had paid in full. Had a great time and the cabin was great, especially the location. Would definitely stay there again. Very Great!.It was our first time and it was very relaxing.